Many sailboats and all power boats suffer from a rhythmic rolling induced by the following seas. Toss in a few cross swells – there are almost always at least one set of crossing swells – and the motion can get tiring in a hurry. 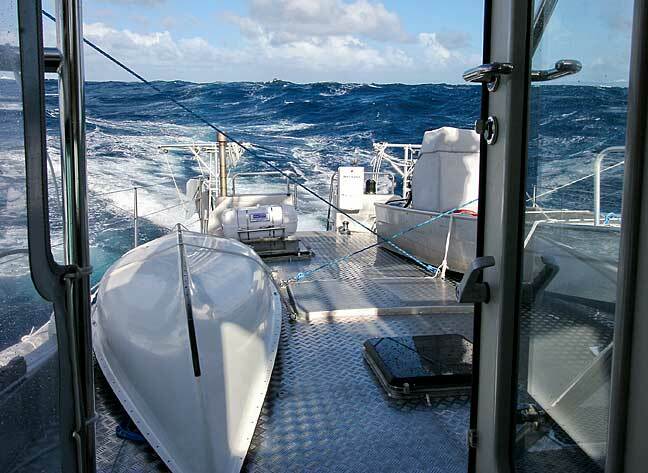 The typical cruising boat – sail and power – has trouble steering in these conditions. Autopilots, wind vanes, and humans all have difficulty keeping the boat headed in the desired direction. In both sail and power, comfort and the risk of broaching make it necessary to change course to one which can be handled more easily by the steering systems. Slowing down is often a part of this equation. In heavy weather, lack of steering control – or the point at which it is lost – is the overriding factor in determining which storm tactics are available in a given situation. We were well-versed in these facts of life when we started design and construction of long-distance cruising boats 30 years ago. 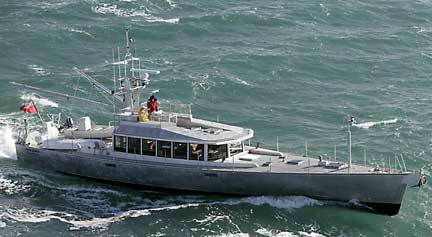 We made downwind steering control and the ability to run safely before a storm a primary focus of every design. This kept us and our clients more comfortable, more rested, and better able to deal with heavy weather while turning in quicker passage times. The most important hull design characteristic controlling downwind steering – in fact all steering – is beam-to-length ratio. 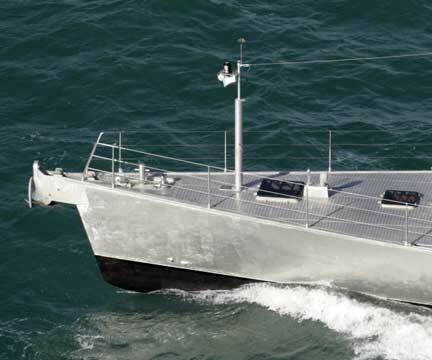 The skinnier the boat for its length, the more directionally stable it is going to be, and the less it is apt to be affected by changes in trim induced by waves. How the hydrostatic properties of the hull change with heel is a corollary. If you get these factors right, the hull will be inherently stable. And if they are wrong, no combination of keel or rudder is going to be able to keep you comfortable or under control in big seas. Contrary to popular lore, the keel has very little to do with steering capability. When steering conditions are tough, the keel does little to hold the boat on course. Our sailing designs have proven this over and over again. If you have any questions about this, check out the Voyager DVD Series. You will see lots of straight line sailing in big waves downwind with very small keels. There are also a series of sailing and FPB videos now online which you can get to here. 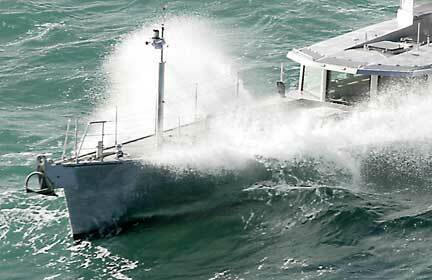 You will find a number of these show how our designs behave in gale or storm force winds. Another part of the control issue is how the bow is shaped. A knife-like bow is what you want for heading into the waves. 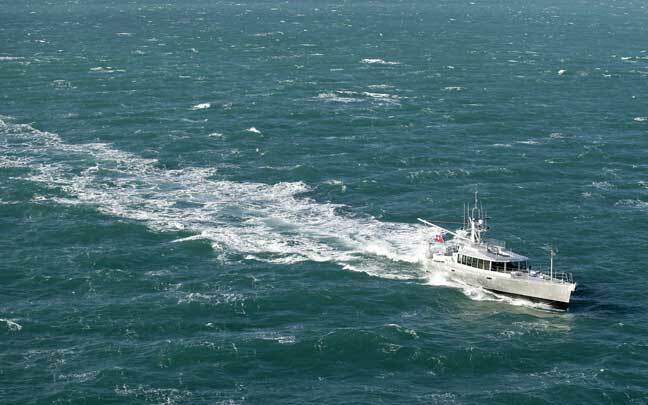 But if the bow has too deep a bite on the water, it will tend to lock in, and the boat will pivot around the bow when it is headed down big waves. This can lead to a broach which, at a minimum, is very uncomfortable and hard on the crew and rig. The basic combination of our hull proportions (modest beam with long waterlines) and moderate displacement make it a lot easier for us to have the best of both worlds. The results are sharp but shallow bows which are comfortable (and fast) upwind, that can be steered downwind by the autopilot at very high speeds. The photo above of Wind Horse was taken while we were running at 12.5 to 15.5 knots, surfing down moderately steep waves with the pilot steering. 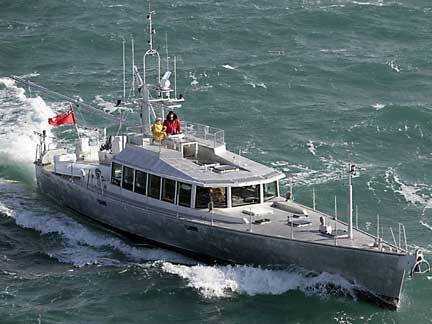 As mentioned elsewhere, we’ve seen speeds to 22 knots surfing down waves with our WH Pilot in total control. And with more than 45,000 miles under our keel we have yet to take manual control of the helm at sea. The key design parameter for control downwind, as previously mentioned, is to have a bow shape that is not excessively immersed to begin with, and which tends to lift as the boat accelerates. 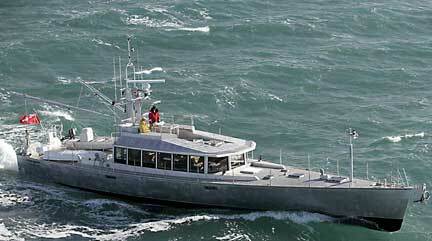 Check out the photo above of Beowulf as she works her way downwind at a steady 16 knots. You can see the bow lifting in the wave crest, rather than digging in. 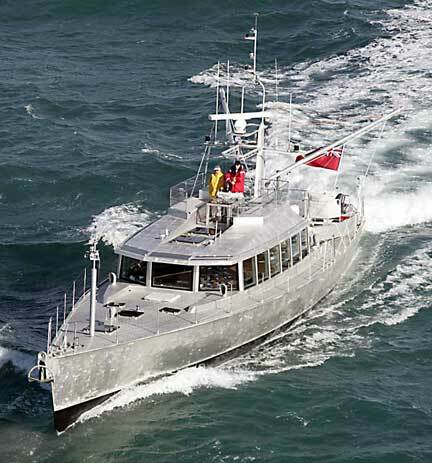 These same characteristics are present in all of our designs in some form, and as you can see above, are inherent in our FPB series (this shot is taken as the boat is surfing at about 15 knots). All these factors that promote safety in storms become comfort in normal trade wind passaging. Get it right for one part of the equation and it will work for the other. A boat which “roots” (steers by its deeply immersed bow) in normal passaging will not be able to run before a storm, and will always have to slow down as the seas build – even in just moderate trade winds. 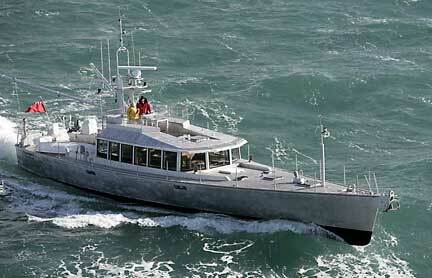 The everyday motion of a hull which has difficulty tracking is far more severe than one headed in a straight line. Now let’s take a look at a series of photos taken with the boat surfing. Each of the next series of photos was taken at 2-second intervals. 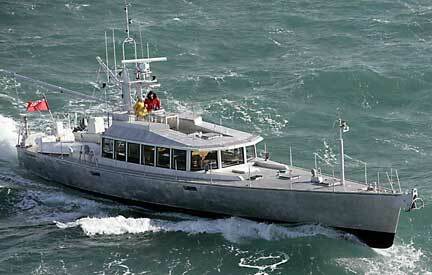 We’re surfing at about 14 to 16 knots in these shots, with the engine running at 2350 RPM. Here we’re just beginning to overrun the wave crest. Notice how the bow lifts rather than digs in. We’re a hair further into the wave here, starting to ride it downhill, “dropping in” as the surfers would say. Still on the crest: kowabunga, dude! Another shot a few seconds later and we’re still riding. The FPB 83 surfs so easily, and under such good control, that we find ourselves looking for routes which allow us to do more. This is great fun! 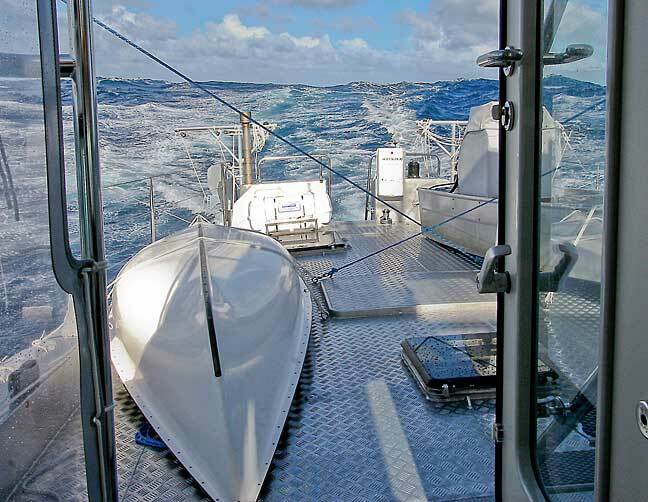 Most oceangoing powerboats have very deeply immersed bows, which is why the only storm tactic that they can employ is heading slowly into the waves. Any other tactic brings with it the potential for loss of control and broaching, with the attendant capsize risks. In the case of the FPB series, by virtue of our our long waterline, and the way in which we are able to distribute volume along the waterplane, even with our knife-like bow we have dynamic lift to raise the bow as the boat accelerates. Though the bow is very fine, it is not deeply immersed by the standards of cruising yacht industry. The bottom line to all of this is that we can maintain our normal cruising speeds off the wind with lower engine RPM and fuel consumption, or increase speed made good for the same fuel burn. Now let’s move offshore between New Zealand and Fiji. The breeze is at about 150-degrees true wind angle, blowing in the high teens to middle 20s. 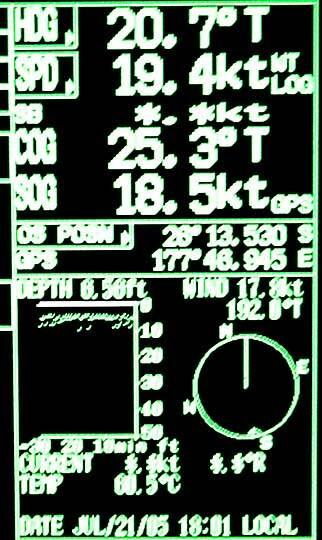 This somewhat blurry image from the data panel on our radar will give you our position, wind speed and direction, speed through the water (19.4 knots) and speed over ground from the GPS (18.5 knots). This is during a momentary surf, and not the fastest we’ve seen by any means. But this is for a fully loaded cruising boat, with the engines turning over at 2000 to 2100 RPM. Going faster means there are fewer waves overtaking us, the hull is more dynamically stable, and the active stabilizers are working more efficiently (the force of active stabilizers goes up with the square of the increase in boat speed). And, in case we didn’t mention it before, going fast is fun. Our experience has been that if we get the right distribution of volume in the hull – bow and stern – then the rudder has little work to do. 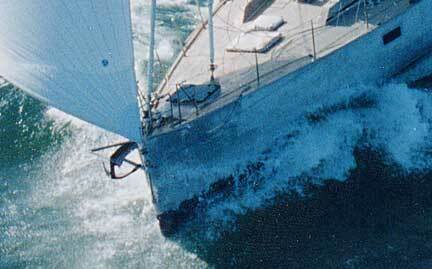 In a sailboat, along with making course corrections required by waves, the rudder also has to offset the rig forces. 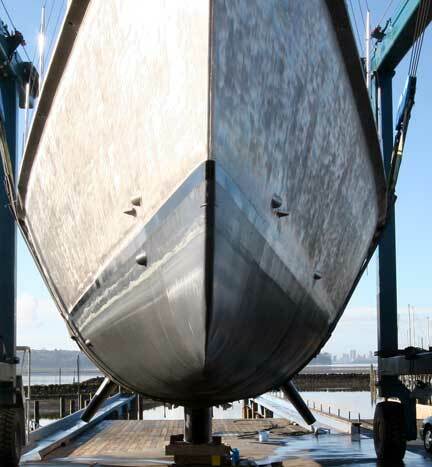 As the boat heels, the rudder’s ability to exert turning moment is reduced (by the cosign of the heel angle). And if the heel causes the rudder to break the surface of the water, the force it can generate will be cut in half (due to the loss of “end plate” effect from the hull). In the FPBs we don’t have to worry about rig forces. Nor is heel a factor. That leaves us with counteracting waves, and maneuvering in port. The latter is not a big problem as we’ve got twin engines,or single engine + thruster. In the end, it is heavy weather control that drives the design decisions about our steering system. You already know that the ability of a foil to generate lift is a function of its speed squared. This tells us that at higher speeds, we don’t need much of a rudder. On the other hand, if we are slowed down for severe weather, the speed that is available for generating rudder lift is greatly diminished. We’ve opted for sufficient rudder area for when we’re hove to under power, “jogging” into big seas, with just enough speed on the boat for steerage. These rudders are over-sized compared to the norm, and we do pay a small straight line performance penalty. But for an ocean crossing vessel there is no choice but to have sufficient control for heavy weather. Long, lean hulls are easier to steer in all conditions. The forefoot is lightly immersed at slower speeds for good wave penetration and lifts at higher speeds for steering control. Surfing presents no special problems and is in fact fun. There is nothing new going on here. We’re just applied the lessons of the past 28 years, creating a comfortable, safe ocean crossing vessel – the same design target at which we’ve always aimed. This entry was posted on Thursday, October 20th, 2011 at 2:57 pm and is filed under Dashew Offshore, Design Objectives, Left Sidebar Posts. Both comments and pings are currently closed.